Infrastructure worldwide has suffered from chronic under-investment for decades and currently makes up more than 60% of greenhouse gas emissions. A deep transformation of existing infrastructure systems is needed for both climate and development, one that includes systemic conceptual and behavioural changes in the ways in which we manage and govern our societies and economies. This report is a joint effort by the OECD, UN Environment and the World Bank Group, supported by the German Federal Ministry for the Environment, Nature Conservation and Nuclear Safety. 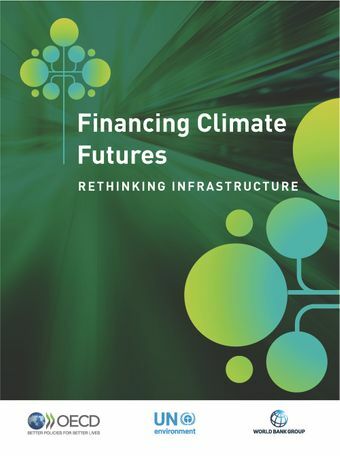 It focuses on how governments can move beyond the current incremental approach to climate action and more effectively align financial flows with climate and development priorities. The report explores six key transformative areas that will be critical to align financial flows with low-emission and resilient societies (planning, innovation, public budgeting, financial systems, development finance, and cities) and looks at how rapid socio-economic and technological developments, such as digitalisation, can open new pathways to low-emission, resilient futures. On 29 November, our team presented the key findings from the OECD, UN Environment and World Bank Group report Financing Climate Futures: Rethinking Infrastructure, which explores six key transformative areas (planning, innovation, public budgeting, financial systems, development finance, and cities) that will be critical to align financial flows with low-emission and resilient societies and looks at how rapid socio-economic and technological developments, such as digitalisation, can open new pathways to low-emission, resilient futures.